Author/Illustrator Matthew Holm: More on "Cupcakes Take the Cake"
The word is out. Kids love Babymouse—star of the popular, award-winning, hilarious, PINK graphic-novel series showcasing the trials and tribulations of elementary school. The sassy mouse with attitude to spare has charmed her way into the hearts of kids, parents, and teachers everywhere! The series has won multiple Children’s Choice awards, and one title was the first graphic novel EVER to be named an ALA Notable Children’s Book. It's champagne wishes and cupcake dreams for Babymouse in Cupcake Tycoon. The school library is having a fund-raiser, and Babymouse is determined to raise the most money and WIN the GRAND PRIZE! Or . . . er, to help the school! 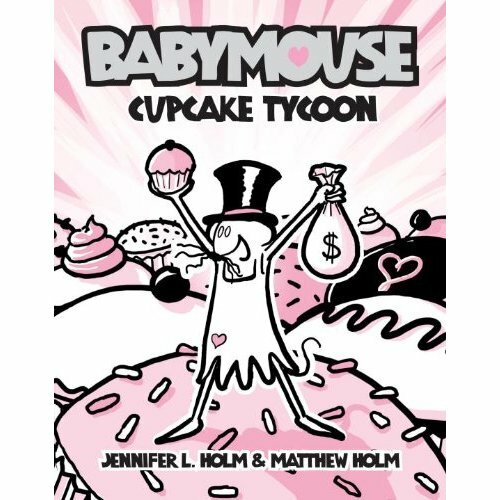 The competition is fierce, but Babymouse will stop at nothing to get what she wants, even if it means outselling every last kid in school . . . including her nefarious nemesis, Felicia Furrypaws. The claws are out and the race is on in this absolutely PRICELESS Babymouse!